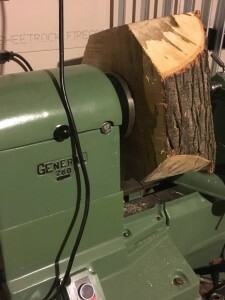 Someone on my street was cutting down a large maple tree so I grabbed a few stumps to try and turn my first bowl on my lathe. The wood looked like fungus had started but it makes a weird star pattern that might look interesting or garbage. I rough turned it to let it dry out quicker. In 6 months I’ll finish it. This entry was posted by admin on Tuesday, November 10th, 2015 at 1:10 pm	and is filed under Uncategorized. You can follow any responses to this entry through the RSS 2.0 feed. You can skip to the end and leave a response. Pinging is currently not allowed.